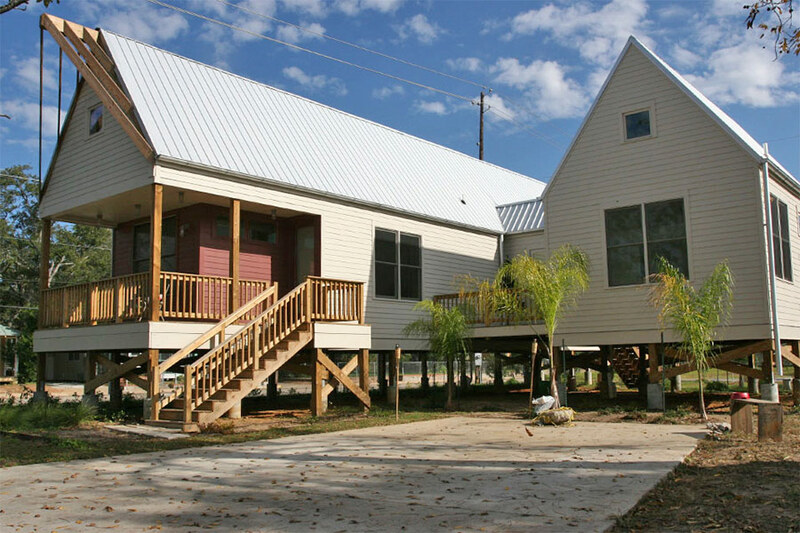 Architecture for Humanity’s Parker House is part of the Biloxi Model Homes program. The San Francisco–based nonprofit Architecture for Humanity (AFH), a 15-year-old organization dedicated to providing critical buildings in areas of need, shut down operations abruptly on January 1st of this year. The official announcement from the board of directors, which came nearly three weeks later, said that the organization was filing for bankruptcy because of “serious funding challenges… the deficit combined with budget overruns and an overall decrease in donations finally became an insurmountable situation.” Coming at a time when the economy is doing well and an interest in bettering the world through design is pervasive, the closure was all the more surprising. The specifics about how the organization got itself into financial straits are still outstanding. But the overall arc indicates that the organization had trouble with the challenge that so many small businesses face—how to scale up in a sustainable way. Launched in 1999, AFH was one of the largest and most high-profile organizations dedicated to humanitarian design, predating later efforts such as Make It Right and Public Architecture’s 1%. The organization provided pro-bono design and construction management services, acting as the developer in complex situations to build homes, schools, clinics, parks, and community centers. With disaster-relief projects in far-flung parts of the globe, they had the status of an architectural version of Doctors Without Borders. It was an ambitious agenda that attracted many supporters and young architects, offering the chance to “design like you give a damn”—also the title of co-founders Cameron Sinclair and Kate Stohr’s 2006 book. Sinclair and Stohr launched AFH as an international competition to design temporary housing for refugees of the war in Kosovo, and encouraged by the response, followed it with another to do mobile AIDS clinics in Africa. Sinclair, who trained as an architect, was a passionate and inspiring spokesperson; and Stohr, a former journalist, was in charge of its day-to-day management. For the first several years, the husband-and-wife team were the only full-time employees. Things started to rev up around 2006, when Sinclair won a $100,000 TED Award, and AFH worked with Oprah’s Angel Network on post-Katrina housing. By mid-2013, it had nearly $12 million in contributions and grants, 32 employees at its San Francisco headquarters, and roughly 40 contractors at various field offices around the globe. It had also moved into its own office, which was purchased and renovated using a $1.9 million loan from a board member. However, the fundamentals were worrisome. In mid-2012, the organization reported a small gap of $88,000 in unrestricted funds, which represents the bottom line for a nonprofit’s financial health, since this general bucket of money is drawn upon for any shortfalls. It had nearly $6 million in the bank, but those funds were earmarked for specific projects; unrestricted funds are used to pay operating expenses such as salaries and rent. By mid-2013, the gap had leapt more than a tenfold to $1.1 million, even as funding had doubled. Reviewing the information, AFH’s auditors reported that “the Organization has suffered recurring losses in unrestricted activities and has a net deficit in unrestricted net assets that raise substantial doubt about its ability to continue as a going concern.” According to Cesal, the deficit was at $2.1 million by the end of 2013. Over the course of the organization’s history, it raised some $50 million dollars for projects in 48 countries. “AFH was designing and developing projects and put boots on the ground in third world countries. Trailblazing organizations like this take on real risk,” says John Peterson, founder of San Francisco–based nonprofit Public Architecture.